(Newser) – Millions of Social Security recipients and other retirees will get a 2% increase in benefits next year. It's the largest increase since 2012 but comes to only $25 a month for the average beneficiary. The Social Security Administration announced the cost-of-living adjustment (COLA) Friday. The COLA affects benefits for more than 70 million US residents, including Social Security recipients, disabled veterans, and federal retirees. That's about one in five Americans. 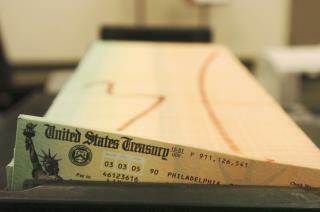 The average monthly Social Security payment is $1,258, or about $15,000 a year, reports the AP. By law, the COLA is based on a broad measure of consumer prices generated by the Bureau of Labor Statistics. Congress enacted automatic annual increases for Social Security in 1975. Presidents often get blamed when increases are small or zero, but President Trump has no power to boost the increase, unless he persuades Congress to change the law. The law stipulates that the COLA is based on a broad measure of consumer prices generated by the Bureau of Labor Statistics. Over the past eight years, the annual COLA has averaged just above 1%. In the previous decade, it averaged 3%. Advocates for seniors claim the inflation index doesn't accurately capture rising prices faced by seniors, especially for health care. Conversely, some conservatives argue that the inflation index is too generous because when prices go up, people change their buying habits and buy cheaper alternatives. Woohoo! I'm gonna get $14 more every month! Somebody is always pointing the finger...it was the democrats it was the republicans it was Obama it was Trump....one day whenever you all decide to stop pointing the darn finger. Make it a way ALL PARTIES will agree then and only then things will be better for all! Disability doesn't pay a darn thing nobody's complaining about 750 per month to live on! Be glad you are getting a raise because the regular Joe gets nada! Oh that horrible, evil Fanta Führer / Cheeto Jesus / TrumPutin! How dare he give old people more money?! We need that money for promoting equality in Africa!